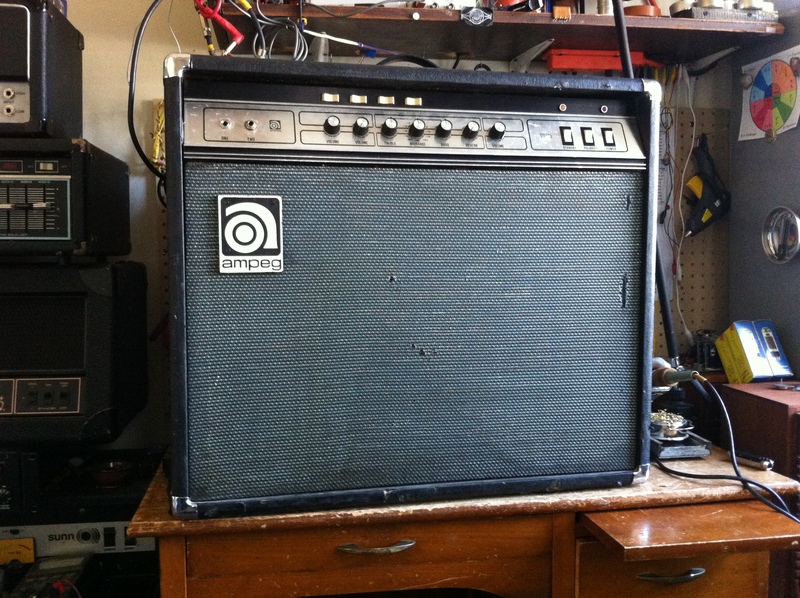 Ampeg VT-22, combo version of the V4. As if that was not heavy enough. I’ve never worked on a master volume version so it was cool to see it in person. These are from 76-79 but are not really any different circuit-wise from the non-master volume version that came before it. Different color PCB (early version was green on top and bottom) and maybe a few component values are different but that’s about it. This amp needed a once-over after being in a bad car crash. Rugged VT-22 survived the crash with only 1 broken preamp tube and one missing. Worst problem the amp had was that EL34s were installed but it wasn’t done right. Original V4/VT-22 power tubes are 7027s but the socket is really wired for a 6L6. 6550s and KT-88s can work too but it can be tricky. V4/VT-22 wiring leaves pin 1 on the tube socket open because there is no connection on pin 1 for 6L6/6550/KT-88 (7027 has pin 1 tied to pin 4, screen grid), but an EL34 has a suppressor grid on pin 1 which must be tied to ground. An EL34, like the 6L6/6550/etc, is a pentode and with the suppressor grid left floating it is only operating in tetrode mode. 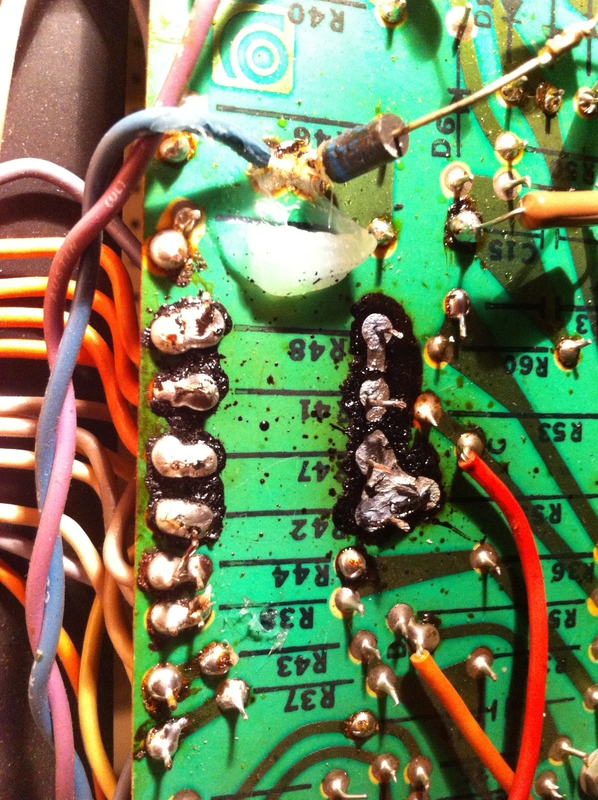 The amp had toasted screen grid resistors and would only put out 75W at clipping. Too much current flowing in the screen. 1K screen grid resistors were replaced with 1.5K/5W and pin 1 was tied to pin 8 (ground) and the amp put out 105W as it should. Great job and thank you, suppressor grids, for re-routing that secondary emission away from the screen grid and back towards the anode. Ampeg VT-22 schematic. V4s and VT22s are wonderful. 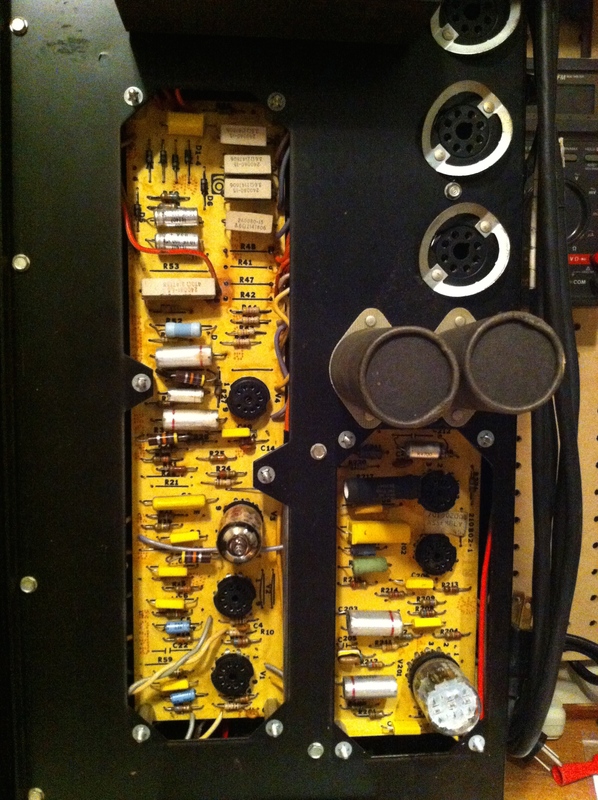 If you want to learn a little more there is some great info at the Atomium Amps site.